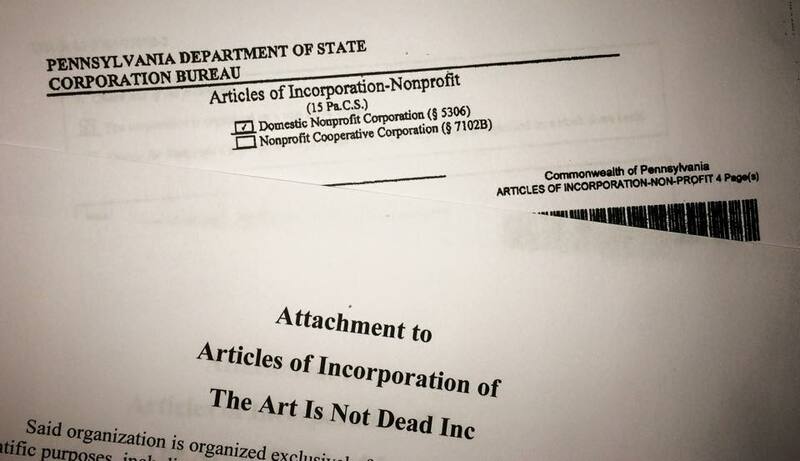 In 2007/2008 Maria Teicher and I started the artist collaborative named The Art Is Not Dead. The name we landed on came from lyrics I wrote around 2007, from a song titled “No, It’s Just Different” (Here’s a video of me performing the song in Bruck an der Leitha, Austria in 2008). Around that time we consistently heard how dead art was, and from the vast amount of creative talent from people we’d met in the last few years (as well as from a historical context), we disagreed. We truly desired finding a way to not only bring those people together, but help them any other way we could. Maria and I provide our services for artists for free or at-cost. We also both have our full time creative endeavors, full time jobs, and the typical perils of life. We’d like others to provide similar services to what we provide, but it’s hard to ask someone else to do it for free – nor should they (unless they’re crazy like me and Maria!). For example: If a recording engineer is good at his job, why should he take away time from his schedule that compensates him for his quality work in order to help out a Philadelphia band? Instead, what if we could, as a non-profit, pay that same recording engineer their going rate (or potentially a lower rate if they wanted to donate some of their time), so that the band receives assistance with the recording of their album AND the engineer is justly compensated? What if we could provide more than just what Maria and I personally could provide? So with the direction of incorporating as a non-profit, much was done throughout the first half of 2015. Business planning, meetings with small business professionals and lawyers, writing articles of incorporation, writing bylaws of organization, filing other necessary State and Federal paperwork – it was a tremendous undertaking. For us, and the vision of what The Art Is Not Dead could offer artists, musicians, and creatives – it was a task worth tackling. Received 503(c)(3) Federal exception determination letter!!! <– THIS is what made us an official Federal non-profit! Mastered material from Science Club, Welter, and Readership for upcoming The Art Is Not Dead Records release, and created promo video for it (see below). We’ve come a long way over the years. There’s still an exciting road ahead, and we have some wonderful things in store throughout the remainder of 2016 and beyond. Thank you all who have been part of this journey, from encouraging words to sweat-equity. We wouldn’t have gotten this far without your participation and enthusiasm.